Taste test: These are very good tortilla chips. 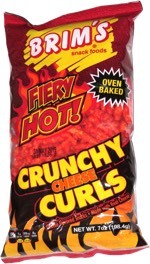 They're fairly thick, crisp and strong enough to stand up to most salsas without breaking. They're also pretty big, with the unbroken ones shaped like a quarter of a circle. 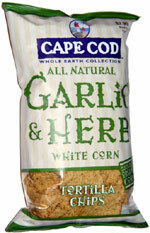 The garlic taste is subtle, but the overall chip is very, very tasty. Smell test: Wow, a great, mildly garlicy aroma. From the package: “Now, we're also proud to wear the label 'All Natural, Made with 100% Organic Corn' on our bag, an assurance of finely textured, flavorful chips (all a subtle shade of off-white with herbal accents and a hint of garlic). While other tortillas might look similar, don't be duped. Many other chips are made from genetically modified crops doused with chemicals — not like us, woth our corn coming from windswept American fields were purity and good taste are cultivated.